This 5 ft. USB to Serial adapter is a tool of choice when supporting serial peripherals in newer computers without serial support. Now supported by Windows 10, this is an ideal solution for device support. This USB 2.0 RS-232 Serial Adapter is the easiest way to add a serial port to your computer. Newer computers today are unequipped to support peripherals requiring a serial RS-232 connection because they lack serial ports; this affects PDA, digital camera, and GPS type equipment that may be used on your system. This adapter also allows you to add a serial port and monitor the status of your connections by using LED activity flashes. When connection activity is present, the LED’s will flash letting you know you have signal on the pins. The GM-FTDI-LED offers an advanced an FTDI Chipset supported by Windows 10, USB 2.0 RS-232 connection with double color LED Display of Full Signal Power. The device is powered individually by the USB 2.0 port. This device is easy to install, it features a Plug & Play Easy test RS-232 Host to Device link and is backwards compatible with USB Spec 1.1. We’ve written a blog post on Serial Driver Support including information on Windows Operating System life cycle. Download page contains a special note with regard to driver install. See special note on download page. Running it with an old school DOS program running in the ‘D-Fend Reloaded’ emulator and works well. LEDs are easy to use for confirmation of data signals. The old Belkin adapter I was using seemed to cause the dreaded BSOD on XP and didn’t support Windows 7. This one works great on either OS. With this adapter I can use my Computrainer with a (late 2008) Macbook, running Windows 7 under Parallels. The blinking LEDs are a nice touch — they let you know it’s working! I ordered this adapter for two uses: First to use with my old X10 controller at home and second to connect to the console serial port on a piece of test equipment at work. For the X10 controller, I elected to the USB/Serial adapter on a Windows 8 PC. I created a “restore point” before inserting the mini CD that came with the adapter (just in case!). Then I plugged the adapter into a USB port and surprisingly there was no request to install a driver. So I looked at the Device manager and found that “USB Serial Converter” appeared without having to install the driver from the CD. I then ran the X10 control software and it found COM4 and worked right away. I haven’t tried the test equipment at work yet, but I don’t expect any problems. And the LEDs will be very useful for this. Awesome!! One of the only serial to USB adapters out there with status lights. Makes it very easy to trouble and diagnose serial data issues and pin configurations. Also works out-of-the-box on Win 7 x64 with no need to install additional drivers. Thanks for the great product!! I needed a serial cable to communicate to an Allen Bradley Micrologix PLC and my laptop does not have a RS-232 serial port. I read about some bad experiences people have had with other adapters. It seemed that the general consensus has been to stick with the FTDI chipset adapters. After looking through some products and reviews, I came across this item. In my opinion, the LED lights to indicate activity was good feature to have for any troubleshooting. My computer uses the 64-bit version of Windows 7. When I plugged the adapter in, the OS recognized it and downloaded the drivers via Windows update. It defaulted to COM7, so I changed it to COM1 and connected it to the PLC. I auto-configured a DF1 channel in RSLinx Classic and immediately discovered it using RSWho. I’ve had it connected to the PLC all day and there have been no issues in the communication. I checked the diagnostics for the channel and there were no bad packets, timeouts, or retries. This seems like a great product. After having struggled with corrupt data on my PL2303-based adapter every few minutes, I was suspecting problems with the target device, especially when the problem persisted after swapping adapters, reloading drivers, and trying a different PC. Lesson learned: Replacing a Prolific chip with another Prolific chip isn’t gonna fix it! Go FTDI or go home. I bought (two of) these and the problems haven’t come back; I can receive *megs* of text without so much as a hiccup. Logging over a long weekend used to be completely out of the question, now it’s become routine. And yes, the diagnostic LEDs are every bit as useful as you’d imagine, perhaps more so. Not only do they show you TX/RX and flow control, but they show you *when the port is open at all*, which is super handy if you’ve got multiple adapters plugged in and you’ve lost track of which COM port is which. Forget the paperclip loopback! Forget unplugging things to see which port stops responding! Just watch each adapter go all Christmas-tree when you open its respective port, and the mystery is conclusively solved. My colleague has been using the other one to drive an old board plotter, which had exhibited inexplicable, random, and extremely frustrating bugs for months. Switching to a genuine FTDI adapter made everything suddenly work! The misbehavior is gone, the software doesn’t lock up anymore, and we’re back to making boards in-house instead of sending them out. Turns out the plotter wasn’t bad after all, it was just a cheap serial adapter! I’m never skimping on cheap serial adapters again. I needed this for connecting my laptop (which does not have a serial port) to a piece of lab equipment. My windows 7 machine did not need the included drivers (on a mini-disk), it just worked when I plugged it in. I am using LABView to communicate thru the USB adapter to control what the lab equipment settings are, or to communicate status/measurements from the equipment and this works beautifully. The LED’s are a nice touch to verify that data is being sent back and forth, which helps when you are setting up for the first time and want to verify communications are working properly. I haven’t beat this up, but it is being used in a work environment and so far this has held up nicely. It’s not industrial strength, but it also doesn’t feel like it’s going to break into pieces if I drop it. I bought several for our lab. 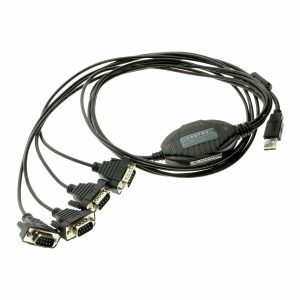 I have to constantly access serial ports on enterprise computer equipment and the absence of serial ports on laptops was something I had to overcome. This cable not only solves my connectivity problem but also comes with a very handy traffic light to let me know if the ports are even working as soon as I plug the cable in. Gear-Mo updates their drivers so I advise anyone buying this cable to visit their website for the latest driver. As far as configuring it simply follow the documentation for your OS and you’ll be on your way. I have used other USB to serial cables but if you need serial DB-9 connectivity buy this one, and you’ll be glad you did. This unit works great and even at the slowest baud rates, 9600 8N1, for my vintage computers. The one item I noticed is that I couldn’t get it to work with different setting 7N1 at 9600baud. I would get garbage characters instead. I know I can use the built-in serial port on my desktop directly without problems at 7N1. Anyone else successful in changing the settings ? Works great. Used on Windows 10. Just plugged it in and drivers auto installed. Great chip set. Used to install Cisco switches and firewalls. As a Network Engineer working with Cisco products it is necessary for me to have a serial port available to console into routers and switches and new notebooks no longer have a serial port as a standard feature so USB serial adapters are required. If you just have a cable then if the console port does not come up then you have to figure out if it is the notebook or the console port that is causing the issue. Having the LED breakout indicators makes this much easier. I highly recommend this product. I love being able to see the leds during operation. I no longer have to login to the computer to check to see if anything is being transmitted. The lights show line status of the RS232 protocol. Truly plug and play! WAY WAY better than the PL2303 based devices! This think plugged and played in both my Win 7 and Win 10 notebooks. Works great with Win7 and PuTTY. Truly “plug and play”, Win7 already had the drivers. LEDs are very handy. It would be incrementally better if the LEDs (TX and RX in particular) were driven by a re-triggerable one shot to keep them lit longer. This USB to Serial solved my comm problem. I am routinely connecting to a 100 foot run to program a LED sign, which in itself can be problematic. The best converted that I had found was unreliable on a Win 8 laptop and unusable on Win 10. The Gearmo converter works well with both OS’s and the LED indicators are nice to visually verify the serial connection and data traffic. I recommend this converter.